Discussion in 'Android News' started by danDroid, Sep 15, 2010. For those of you who don’t know what Voice Actions are, they are a series of spoken commands that let you control your phone and perform many functions using nothing but your voice. It is a download that replaces your current Voice Search app and brings many new and more comprehensive functions to your search button. It is accessed the same way the old Voice Search was accessed, from the Search widget or by pressing the search button and holding for a couple seconds. You can send a text message directly from your search button by simply speaking “Send text to [name][body of text]”. You can also use it to navigate to your destination by saying “Navigate to [destination]”. It can be used to send emails by saying “Send email to [name][body of email]”. You can use it to make calls, play music through many different apps including Pandora, go directly to websites, perform Google searches, and more. The best part about it is that it actually works. 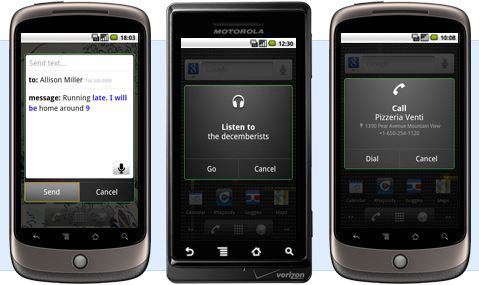 When you use it for the first time, a help window pops up that explains all the different functions that Voice Actions brings to your phone, and even has a link to a video to help you even further. One of the features that I really like about it is that you can create new Pandora Stations on the fly simply by speaking “Listen to [band name]” and then selecting Pandora from the list of available music apps. It is a free download from the market and is only available to devices running Android 2.2. I've played around quite a bit with this new froyo feature on my D1. However, it never recognizes the names in my contact list correctly. :icon_evil: Thus, the most important vocal commands -- to call, text, or send an email to a human person with a proper name -- are useless. It never fills in the "to:" line. And/or it misinterprets contact names as regular words or as place names or something else every frickin' time! So annoyed. has there been a clock that works to set the alarm to? I have a weird problem...my phone announces calls with voice, then ring...no clue what I changed to make that happen...how do I turn it off? There is a new DeskClock.apk that fixes that. Also, just so no one gets confused..this is Google's latest VOICE SEARCH update... do not be fooled by "non-Google" Market apps named "Voice Actions" or similar. This is just the latest Google Voice Search update (v2.0.1) for the stock app. Oh, and in case anyone asks, it has already been included in all my Themes for a while now, no need to rush to the Market. When they get Bluetooth worked out so it works for more than just voice dialing and fully integrated with this I'll really love it. Until then I still have to pick my phone up and take my eyes off the road while I'm driving. Not good. I've been messing with this for weeks and I very much like the improved voice search over the one that shipped with the phone. Does anyone know if there is a way to cancel a misinterpreted voice dial command? It sometimes accidentally calls the wrong people from my contacts list, and I can't figure out how to stop it before the call goes through. If it's a Bluetooth-headset initiated call I just hit the button on my headset again. It hangs up. 9 times out of 10 it doesn't dial out. Droid 2 already has this installed. Edit the previous post: the contacts sync box was not checked. That did the trick! Thanks, gelopez! It does feel a little bit like big brother that my phone has to be a hooked onto my computer for it to work..